Wednesday the 18th of January 1871 was a bitter cold day. At noon, with the smell of smoke in the air from nearby Paris, burning under the Prussian siege and bombardment, a magnificent and fateful gathering took place in the Palace of Versailles. An event that would sow the seeds of resentment in the French people against their German conquerors. An event that would play on the minds of the French 43 years later and help to propel Europe’s slide into World War I. 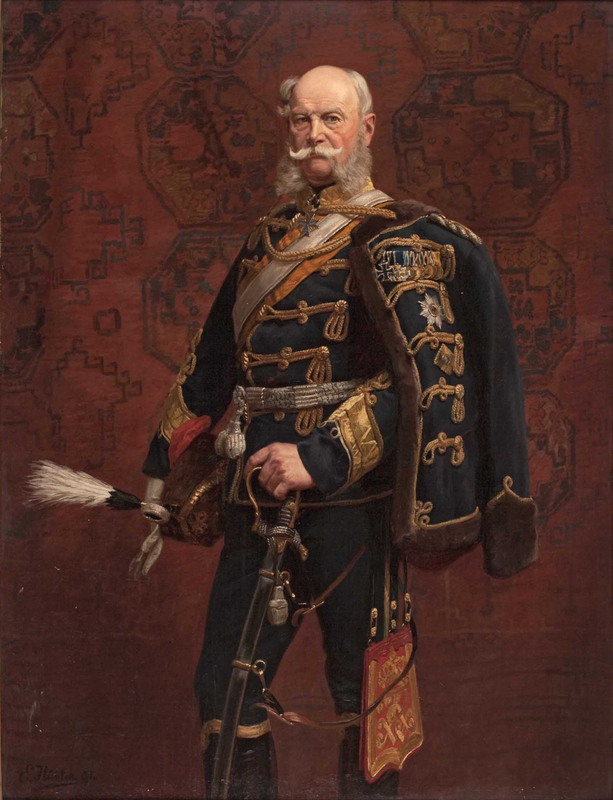 In the Hall of Mirrors, on this day, King Wilhelm of Prussia was crowned Kaiser of the Germans. It was a moment for which the Prussian Chancellor Otto von Bismarck had devoted all his craft and considerable energies, the unification of all German states into a single empire led by Prussia. It had taken two wars over six years – first with Denmark in 1864, then with Austria in 1866 – to establish Prussia’s dominant position among the German-speaking states and to bring the northern states into a confederation. In 1870 he produced a third conflict – this one with France – by provoking Emperor Napoleon III into a declaration of war. French aggression, Bismarck calculated, and the resulting need for a collective German defence would have the salutary effect of encouraging the still-independent southern states – principally Wurtemberg and Bavaria – to join the northern confederation. The combined German armies under Prussian leadership defeated Napoleon’s forces with unexpected ease and then embarked on an invasion of France. Even as military operations dragged on longer than expected – stubborn Paris refused to capitulate and guerrilla activities mounted against the German occupation – Bismarck knew the time was right to complete an empire and crown an emperor. He made a variety of concessions to the southern states to overcome their remaining reluctance over the loss of sovereignty to the Prussian confederation. One secret arrangement involved furnishing the mentally unstable King Ludwig II of Bavaria with substantial Prussian funds to reduce the considerable debt he had amassed in his mad castle-building spree. 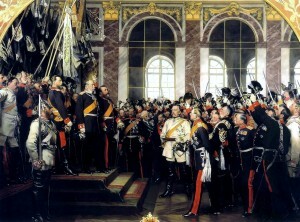 Standing with Bismarck in the crowded hall waiting for the coronation ceremony to commence was that other architect of victory, the great Prussian General von Moltke, the success of whose war plans had made the day’s events possible. Others in attendance included General von Roon, the Prussian War Minister; the Kaiser’s son the crown prince of Prussia (deemed by his soldiers too tender-hearted for the enterprise of war); the crown prince’s own son, almost thirteen (who as Kaiser Wilhelm II would prove far less tender-hearted than his father); and a large collection of kings, grand dukes, princes, landgraves, margraves and lesser ranks of rulers assembled from the various states of Germany. It is twelve o’clock. The boom of a gun far away rolls above the voices in the Court hailing the Emperor King. Then there is a hush of expectation, and then rich and sonorous rise the massive strains of the chorale chanted by the men of regimental bands assembled in a choir, as the King, bearing his helmet in his hand, and dressed in full uniform as a German general, stalked slowly up the long gallery, and bowing to the clergy in front of the temporary altar opposite him, halted and dressed himself right and front, and then twirling his heavy moustache with his disengaged hand, surveyed the scene at each side of him. Ten days after the coronation at Versailles, combat operations in the Franco-Prussian War came to an end with the capitulation of Paris. In March, Kaiser Wilhelm returned to Berlin, where standing on the royal balcony with his grandson he was hailed as the conquering hero by rapturous crowds. On 10 May 1871, the Treaty of Frankfurt was signed, by which, in addition to paying an enormous indemnity of 5 billion francs, France was required to hand over to Germany the provinces of Alsace and Lorraine. So, in military triumph, the German Empire was born. It lasted not quite a half-century, ending in 1918 with Germany’s defeat in the First World War. Kaiser Wilhelm II abdicated to a modest retirement in Holland, and Germany became for the first time but not the last a republic.